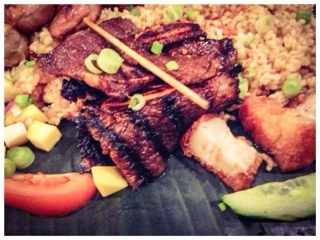 If you haven’t been to Casa Manila since 2010, I suggest you plan a return visit. There are new owners in town, Mila and Rizalde, and they have revamped the restaurant from fast food to fancy feast. 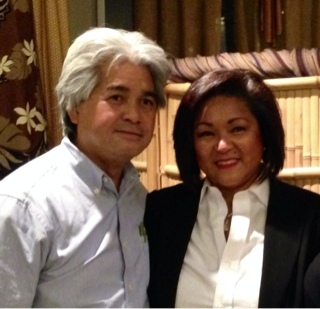 Having the pleasure to speak to Mila, I was entranced by the passion she showed for Filipino food. She had entrepreneurship in her blood running a successful import business. After selling this, she saw a gap in the Filipino food community - too often the eateries were fast food or ready-to-eat style, providing a lackluster experience. Having resided in Canada since childhood, she saw the rise of the public’s acceptance for other food cultures … but alas for Filipino food it seemed stuck. So, finally she took the plunge and along with Rizalde purchased Casa Manila to use as a vehicle to showcase Filipino cuisine in the way it deserved: using fresh ingredients, leaving out additives such as MSG and making it healthier (less salt, oil, leaner meats and vegetarian options). 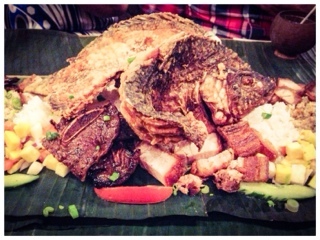 They offer a la carte options, but for those who don’t know what to order and want the full experience, Casa Manila also creates a Kamayan feast – something generally experienced on special occasions in Filipino homes. 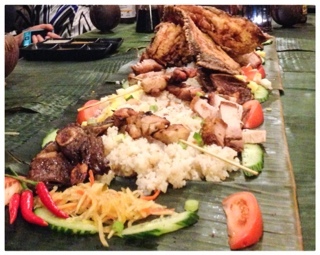 Kamayan is essentially a family-style “picnic” that’s laid out on banana leaves allowing eaters to gather around and pick and choose morsels to their heart’s desire. Eating with your hands is an intimate event. Mila put it best by explaining that it allows you to experience food with five senses – you feel the food as well. 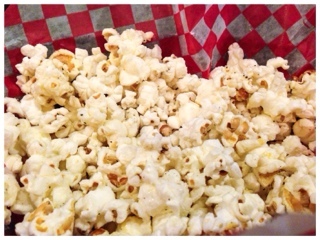 Before the feast began, we noshed on some adobo dusted popcorn (imagine a sweet and salty kettle corn) and sipped on refreshing calamansi mojitos ($27 a pitcher or $7 a glass). The calamansi, a Filipino citrus that’s a cross between a lime and orange, offers a tart but slightly sweet balance. Against the heavier Kamayan feast it’s quite nice. 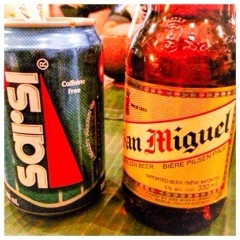 For those who are nostalgic for the drinks from the Motherland, Casa Manila also offers Sarsi (a root beer that has a pronounced licorice flavour) and San Miguel (a lighter lager). A great accompaniment with the drinks was the chicharon manok and atchara (chicken cracklings with slaw). 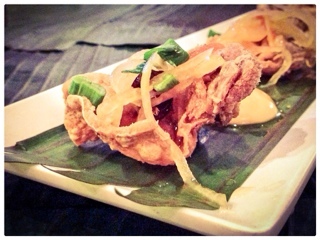 The thick piece of crispy chicken skin was dusted with adobo seasoning and well drained so it wasn’t greasy. Topped with a delicious pickled green papaya slaw it balanced out the skin’s heaviness – a dangerous dish that makes you forget what you’re eating. 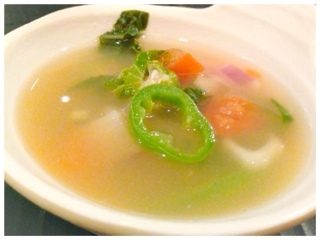 To start, bowls of sinigang baka (beef tamarind soup) were brought out to warm us up. It’s savoury but also sour from the tamarind. There’s a fresh clean taste to the broth from the plethora of vegetables mixed into it (okra, bok choy, tomato, jalapeno, eggplant, etc). Add a dash of fish sauce and it completely changes the flavour profile, enhancing the savoury part of the soup. 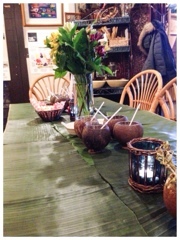 Then with a flourish people were bringing out great rectangular swaths of banana leaves adorned with so much food! The star of the show was the flying tilapia holding centre court amongst all the other items. The deep fried fish was served whole with the meat filleted away from the bone to give it the “flying” description. Consequently, it also helps the fish’s meat cook faster so retaining its juiciness despite being thoroughly deep fried. Diners are offered six different sauces to dip to their heart’s content. I found the vinegar or the adobo was great with this. 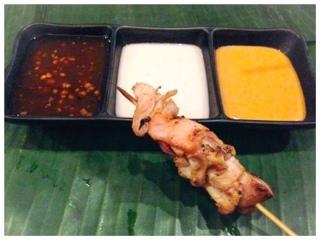 Indeed, the tinuhog na manok (chicken skewers) was probably the best way to experience the sauces. Casa Manila branched into the sauces as an add-on item and now patrons can also purchase jars of them to go ($8.99). Honestly, each sauce had its own highlights: the garlicky sweetness of the adobo, the light creaminess of the coconut ginger or the aromatic savoury peanut sauce. They all went well with the chicken so really would be a matter of taste what to use. Something that didn’t require any sauces was the inihaw baka (grilled beef ribs). They were already marinated in a flavourful sweet, garlicky soy sauce and finished off with a slight smokiness from grilling. If you like kalbi you’ll love these, I personally ate five slices of these and could have easily demolished a platter. Mila explained that Filipinos love their crunch, and with the lechon kawali (fried pork belly) crunch is what you’ll get. 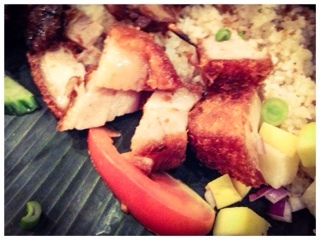 Having been deep fried, the pork belly develops a crunchy exterior on top of its already crunchy skin. If you’ve had Chinese roast pork, imagine this but then deep fried as well. The layer of fat between the meat and skin gets encapsulated and melts slightly so that each bite is tender and rich. 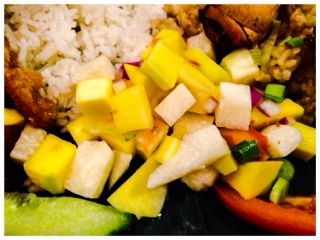 Luckily, there was plenty of hilaw manga insalada (green mango salad) to help cut through the greasiness. Its “simple” as the flavours predominantly come from the tastes of the ingredients themselves – the tart green mango, slightly sweet crunchy jimaca, zing from the onions and juiciness of tomatoes. At the end of the dish was more of the atchara green papaya slaw, which is outstanding! I could eat this by itself or on top of grilled meats, such a great combination of sweet, savoury and vinegar. 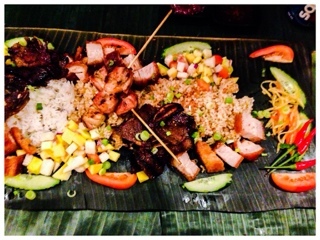 If you’re interested in trying the Mabuhay Collection Kamayan feast yourself, round up at least three people and you can each experience the above for $28 (plus taxes and gratuities). Additional diners can easily be added and Casa Manila will adjust to ensure there’s enough food for each added person. I highly suggest you add on the garlic fried rice ($1.50). Stir fried sticky rice spiked with garlic … do I need to say more? Plus, rice is what helps you truly accomplish the “eating with your hands” experience. Simply take a small mound of rice (pinching it together), top it with bite sized pieces of protein and voila bring it up to you mouth and enjoy. If you’re still hungry after the feast (go you! ), Casa Manila also offers add-ons. 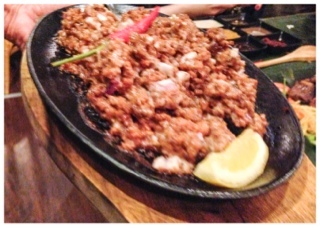 Some may enjoy the sisig pork mask (pig head meat; $13) or sisig bangus (milk fish; $15) served in a sizzling hot plate. The small pieces of protein are mixed with a vinegar, crunchy pieces of skin and other spices. These dishes went well with the plain rice they also offer. Personally, I found the sisag too rich after having so much protein already. 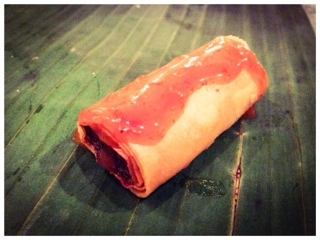 But, the Lumpiang Shanghai baboy (pork spring rolls; $9 for 10) may just be that last little bite you need to round out the meal. Filipino cuisine is influenced by other countries and this is from China. 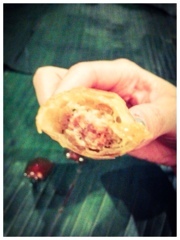 However, the spring rolls have their own distinctness with the minced filling (rather than slivers), being more meaty and held together better from the egg added. 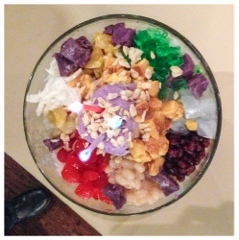 Do yourself a favour and save room for the halo halo that finishes off the feast. It’s captivating to look at comprised by over a dozen ingredients: a shaved ice base, milk sweetened with pandan syrup, fruits, various beans, custard, coconut jelly, puffed rice flakes and topped with a big scoop of ube taro ice cream. It’s whimsical and colourful – sure to please children but excites adults alike. 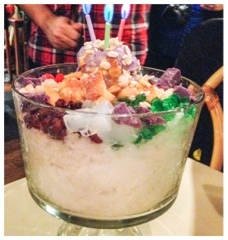 I’ve seen pictures of halo halo before and somehow the thought of it never appealed to me. I’m not one for eating a messy slush of ingredients as it can be disastrous if the ingredients don’t complement each other. But, the server insisted that the dessert has to live up to its name (mix mix) otherwise you’re just eating shaved ice with toppings. So, I trusted him but looked dubiously at the purple slush presented afterwards. Admittedly, it’s rather good all mixed in together. 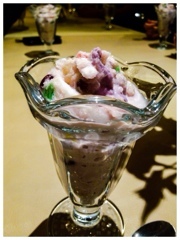 Certainly the shaved ice goes well with the creamy yam and taro ice cream. And there’s a playful element that comes from not knowing what you’re going to try next – one bite there’s a chewy jelly, another a plump plantain or a meaty red bean. If you’d rather have something simple, they also offer a selection of ice creams ($4 or $12.50 for a take-out container). Made exclusively for them by Marble Slab, there’s interesting flavours such as ube (yam), coconut, mango or avocado. 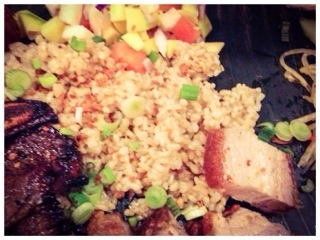 At last, I’ve had my first taste of Filipino food. For a while, I lived near an eatery but they seemed to only serve fried chicken and little else. Thanks to Casa Manila, foodies finally have a place to try Filipino cuisine in the way it’s meant to be served – traditional, fresh and delicious. Certainly, they have changed things up a bit, offering vegetarian and gluten-free options to allow the cuisine to be more inclusive. Filipinos have a beautiful saying “mabuhay” which encompasses welcoming, celebrating (“cheers”) and blessing (“may you live”). 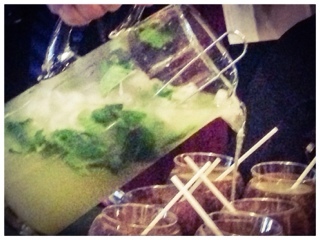 Thank you Casa Manila for the lovely evening where I certainly felt all three. * Disclaimer: The above meal was complimentary. Rest assured, I still offer my honest opinion.